The Sea Sport 24 is a 24-foot fiberglass power boat. It is moored at Elliot Bay Marina in Seattle. It is taken off the dock about 75 times per year for a yearly total of 100 running hours. Sea Hawk Smart Solution was applied to 100% of the hull in June 2011. 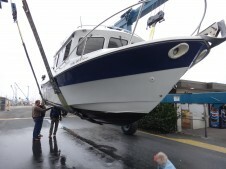 In November 2011, the boat was hauled out and pressure-washed. Between December 2011 and June of 2012 it was dry-stack stored, after which it went back in the water at Elliott Bay Marina. It was hauled again in October 2012 for a pressure wash. Pictures are from this October 2012 haul-out.